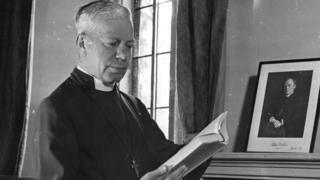 Further allegations against the late Bishop of Chichester George Bell are "unfounded", a Church of England (CofE) appointed lawyer has ruled. In 1995, it was claimed the churchman - who died in 1958 - had sexually abused a young girl when he was bishop. The CofE eventually settled over the claim but a review in 2017 criticised it for not being fair to both sides. The later allegations were assessed by lawyer Timothy Briden, who has dismissed them. The senior ecclesiastical lawyer was appointed by the current Bishop of Chichester, the Right Reverend Martin Warner, to review the information. In a statement published on Thursday, the Church's National Safeguarding Team said: "The Church's response has included an independent, thorough investigation by former Det Supt Ray Galloway. This was submitted to Mr Briden. "There were no safeguarding issues arising out of the fresh information and Mr Briden concluded that the allegations presented to him were unfounded." Of the five later complaints, one was unproven on the basis of it being an "unreliable" account, while another was "inherently unconvincing and without corroboration". Another of the complaints was from a man who said as a boy of 13 he met Bishop Bell repeatedly. He did not remember any abuse, but "blanked out" memories of the meetings. When questioned by Mr Galloway, he was unable to identify with any certainty that Bishop Bell was the clergyman he met. The original 1995 allegation against Bishop Bell was not investigated. In 2013, that complainant, only identified as Carol, wrote to the Archbishop of Canterbury, Justin Welby, at which point the matter was referred to police. In 2015, the Church paid £16,800 in an out-of-court settlement and apologised to Carol. However, supporters of the bishop sought a review into how the Church arrived at that decision. In 2017, that review, by Lord Carlile QC, concluded the Church's response had been "deficient" and failed to follow a process that was "fair and equitable to both sides", adding the reputations of the dead were not without value. Bishop Warner said: "The judgement from Tim Briden... brings to an end a lengthy examination that has drawn on the recommendations by Lord Carlile. "The Diocese of Chichester has rightly been called to account for its safeguarding failures of the past, shocking and shaming as they were. We hope that the culture of the diocese has changed. "Bishop Bell cannot be proven guilty, nor can it be safely claimed that the original complainant has been discredited. There is an uncertainty which cannot be resolved." Archbishop Welby apologised "unreservedly" for mistakes made after the original allegation. He said: "Bishop George Bell is one of the most important figures in the history of the Church of England in the 20th Century, and his legacy is undoubted and must be upheld. "However, it is still the case that there is a woman who came forward with a serious allegation... and this cannot be ignored or swept under the carpet."